Those lessons from my Girl Scout days were feeling pretty hazy, and we needed a rockin’ campfire to cook the hobo bundles at Camp Sunset, featured in the May 2015 issue. Fortunately, we had an expert on hand to teach us the basics of how to build a campfire for cooking. Alameda Co. firefighter Charohn Dawson shared these easy tips. Small kindling will catch quickly and bigger logs will hold the heat. Dawson explained that you need a mix. Check your campground’s website to see if they let you gather wood, have wood for sale, or if they let you bring it from home. You’ll also need some newspaper and a fire starter (preferable to matches when it’s windy). The safest place for your fire is the fire ring in your campsite. It comes with a built-in grill that lifts out of the way (for building the fire) and back in place (for cooking). I’d heard of setting up firewood in a log cabin, or box shape, and also of setting it up vertically, like a tipi. Dawson recommended doing both. First he set up 4 big logs in a box. Then he set up smaller tinders inside the logs in a tipi, with some crumpled newspaper underneath them. When he lights the paper, the fire moves vertically, igniting the tinders and preheating the bigger logs. It takes 1 to 1 1/2 hours for a campfire to burn down to the low flames and glowing embers that are perfect for cooking. This is your golden time for happy hour. 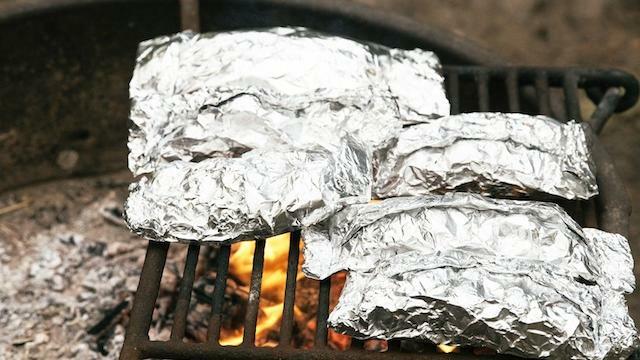 Here’s our favorite happy hour snack for camp. To see Dawson in action, check out this video on how to build a campfire for cooking.